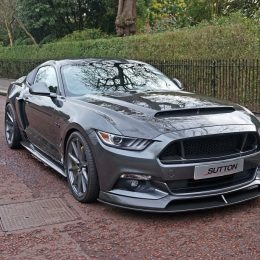 The CS800’s debut follows the launch of the Sutton Bespoke Mustang programme last year by Clive Sutton, one of London’s leading supercar and luxury car dealers. The CS800 Power Package uses a Stage 2 Whipple supercharger, upgraded intercooler, new injectors and a larger throttle body. A new exhaust system, with long tube headers, sports catalyst and active-controlled quad tailpipes, rounds off the major powertrain upgrades. 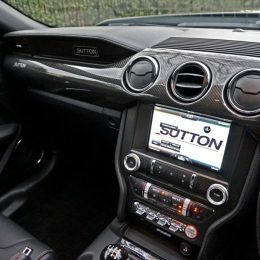 Sutton Bespoke has focused on delivering the optimum balance between stability and comfort, employing a unique three-way adjustable suspension setup that is more compliant than the car’s CS700 sibling. 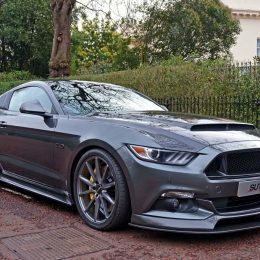 The exterior modifications include a deep carbon-fibre front splitter and side skirts, prominent ‘Super Snake’ bonnet, a carbon-fibre bootlid with integrated flip-up spoiler, and a sculpted carbon-fibre rear valance that houses the large exhaust tips. 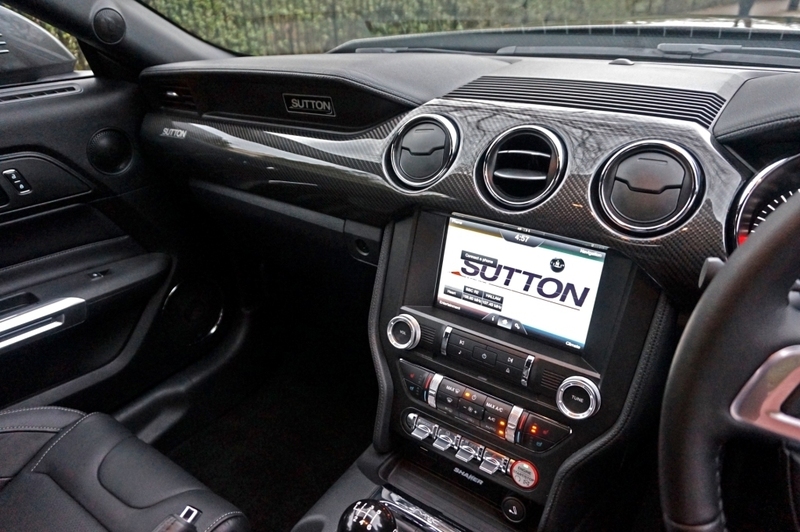 Inside, the Sutton CS800 features a custom installation of the Ford Performance Recaro seats (specially fitted with electric height and reach adjustments) – which are not usually available on standard UK cars – as well as a bespoke carbon-fibre dashboard, the short-shift gear lever and exclusive Sutton badging throughout, including CS800 stitching on the Recaro seats. The CS800 demo car on display at Top Marques also features a nine-speaker 1,100-watt Audiofile hifi upgrade. 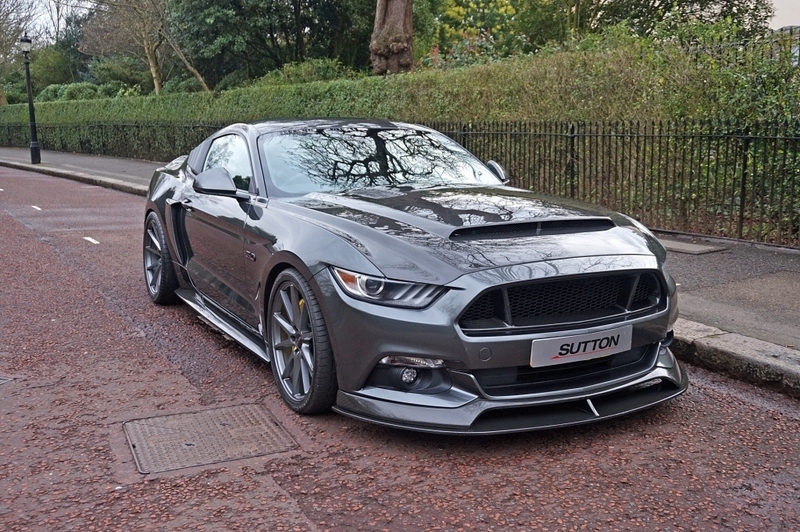 The Sutton CS800 Mustang is priced from £64,950 (incl. VAT), with customers able to specify individual performance and styling packages and options to suit their preferences and budget. 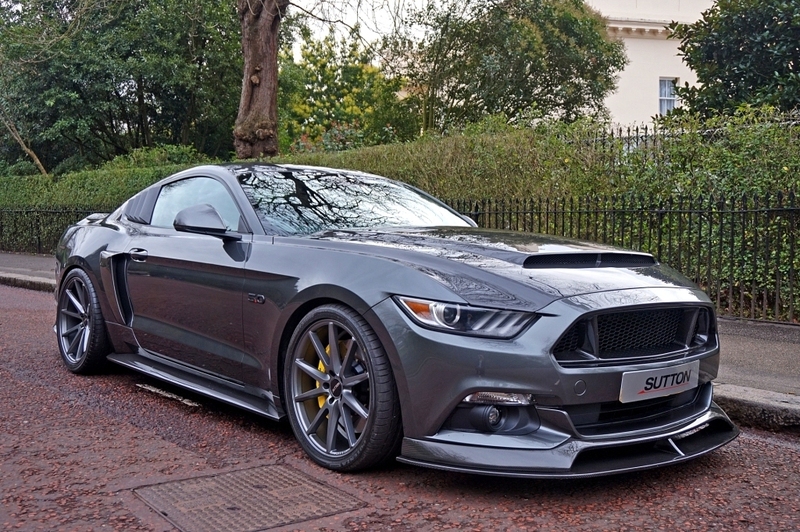 The Sutton CS800 Mustang will be demonstrated to prospective customers throughout the Top Marques show with a series of drives around the legendary Grand Prix circuit. Alongside the reveal of the new 800hp flagship model, Clive Sutton is exhibiting the first left-hand-drive build of the 440hp CS500 Mustang Convertible. 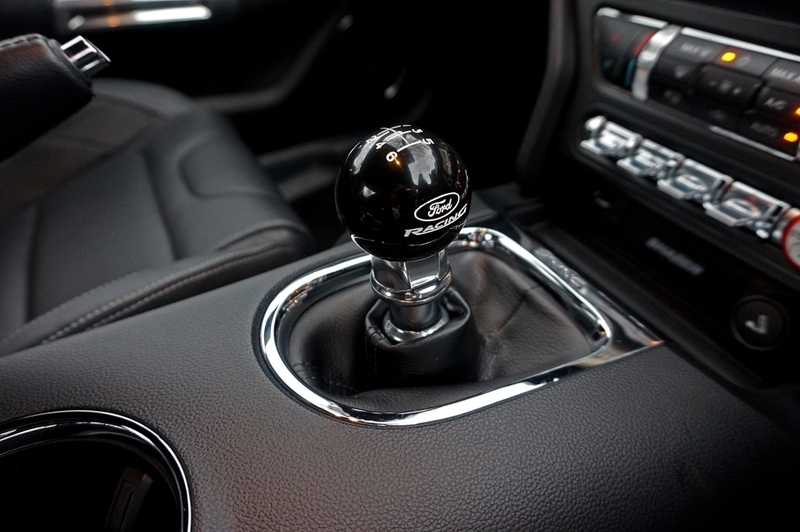 The first demonstrator model of the CS350 Mustang – using the 2.3-litre Ecoboost engine – has also been completed. 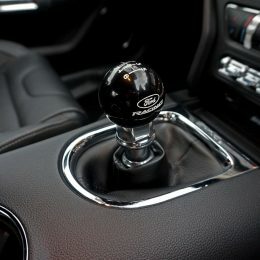 Sutton’s display at Top Marques will also include a brand new Ford F-150 Raptor in custom matt black with carbon trim. Clive Sutton has already supplied three examples of the latest Raptor to customers across Europe. A customer-commissioned luxury car will be revealed on the show stand, demonstrating Sutton Bespoke’s ability to create unique cars to order, personalised down to the smallest detail. 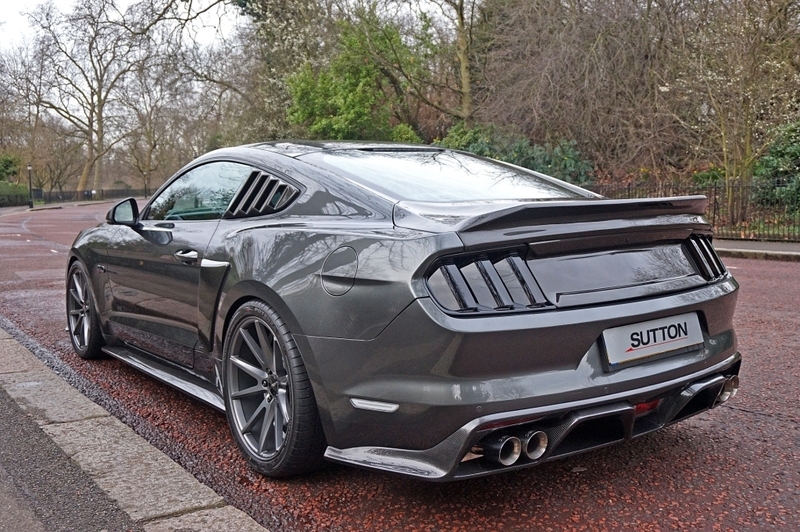 With more than two decades of experience in providing buyers with tuning packages using the best selection of aftermarket components, Sutton Bespoke is using its presence at Top Marques to launch of a new range of Sutton-branded suspension and exhaust systems. 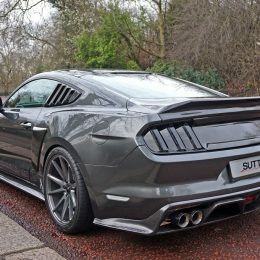 One of the most common requests to Sutton Bespoke in regard to the new Ford Mustang is to enhance and amplify the exhaust sound from the 5.0-litre V8. Sutton’s new exhaust systems are designed to deepen the note at low speed and extend the audible range, from bass to baritone. The ‘cat-back’ upgrade incorporates an ‘X-pipe’ design that deletes the central silencer, reduces back pressure and increases the exhaust flow rate – particularly at higher engine speeds. A more versatile upgrade involves replacing the rear silencers with quad-tailpipe units with ‘Active Control’, where the valve in one of the pipes on each side is controlled by remote control to switch the exhaust on-demand from ‘Normal’ to ‘Loud’. The Sutton Quad System provides a deep, satisfying exhaust tone at the touch of a button. While this solution requires a custom rear valance to be fitted, a Sutton Dual System is also available, which retains the original valance and slots straight into the joints of the OEM system. Both systems can be purchased from Sutton Bespoke as stand-alone items, or incorporated into the project build of a complete vehicle (see www.suttonbespoke.co.uk/sutton-performance-exhaust for details). Clive Sutton has been at the forefront of the performance car retail industry for over 30 years, and has been a regular fixture at the Top Marques show for 10 years. 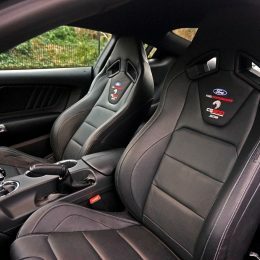 As the founder of a renowned independent specialist car business in London, UK, Clive Sutton has built an unrivalled reputation for supplying some of the most sought after cars in the world – many of them to clients in Monaco. More information about Clive Sutton can be found at www.clivesutton.co.uk.